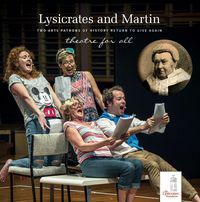 Starting with the birth of democracy and theatre in ancient Athens, Lysicrates and Martin transports you to today's Australia, with side visits to Ireland, Byron's Greece and the horse boxes of Parramatta's Government House. It tells the story of how a couple's stroll in the Royal Botanic Garden Sydney sparked two marvellous restorations: the first, Sydney's graceful replica of Athens' Lysicrates Monument; the second, a drama competition for which the ancient monument was built to celebrate. On the way you will meet the extraordinary unknown figure after whom the hub of Sydney is named, rub shoulders with playwrights, actors and directors, and learn about the arcane techniques of stonemasonry. And you will be intrigued that today in Australia, for the first time in 2500 years, the outcome of a free drama competition is decided by the votes of the audience, not the opinions of a panel or an artistic director. It is theatre for all. It is democracy. A special offer made just to English Teachers Association NSW – use the promo code 'LYSICRATES' at check-out and receive 20% off the RRP.